RV'ers who take the Gulf Coast route prefer this to the Matamoros entry. Easy, pastoral drive for first couple of hours. Avoids city traffic. 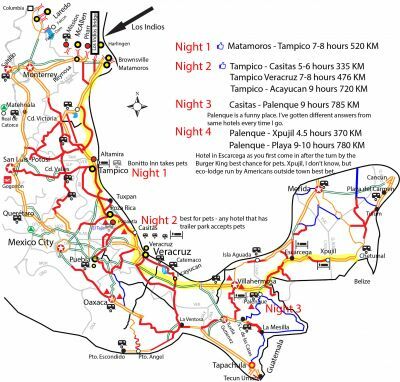 Joins Matamoros and Reynosa routes at El Tejon Jct. Transmigrantes all cross here. There will be caravans of three or four vehicles going back to Guatemala or Belize. Plenty of RV parks, hotels, some scenic spots.